When sweet, juicy strawberries finally arrive in spring, my husband will choose to eat a banana instead. When I can’t get my fill of peaches, plums, apricots, and candy-sweet pluots in the height of summer, my hubster still prefers a banana. In fact, hardly ever varying from habit, he eats a banana just about every morning. It’s not that he doesn’t like other fruit. It’s not even that bananas are his favorite thing in the world to eat. It’s just that — how can I put this delicately — he’s lazy. Oh, believe me, he will be the first to admit that he is. Go ahead, ask him. Why go to the trouble of washing and slicing other fruit, he will tell you, when a banana requires none? Case closed. A banana does possess many merits. It’s the perfect grab-and-go food. It’s easily portable, what with its own built-in protective case. It’s full of good-for-you potassium. And it’s easy to digest — for everyone from kids to grandparents to those with upset tummies. I enjoy bananas, too — sliced atop Greek yogurt, with a sprinkling of crunchy granola. I also love them in banana bread, still warm right out of the oven. So when I spied this banana bread recipe from Oakland’s Bakesale Betty, I knew I had to try it. I’ve yet to have the pleasure of visiting the Oakland shop, where the fried chicken sandwiches and strawberry shortcakes are legendary. Because the place has such a following already, I had high hopes for this banana bread by owner-baker Alison Barakat, an Aussie transplant who used to work at Chez Panisse in Berkeley. Trust me, it didn’t disappoint. The batter mixes up easily, with no ingredients for which you’ll have to make a special trip to the store. And if you have a husband like mine, you always have bananas on hand, and have no excuse not to bake this treat. In fact, I almost always have a few peeled, over-ripe bananas in a plastic bag in the freezer for times just like this or to whip up smoothies. Just defrost in the fridge ahead of time for baking, or toss them still-frozen into a blender for a thick, creamy protein shake. I added chopped pecans to the banana bread batter, only because I like the added texture and I happened to have some on hand. Pour the batter into the greased and floured loaf pan, then sprinkle on the cinnamon-sugar mixture. What emerges is a cross between banana bread and coffee cake, with a wonderfully moist, tender crumb. 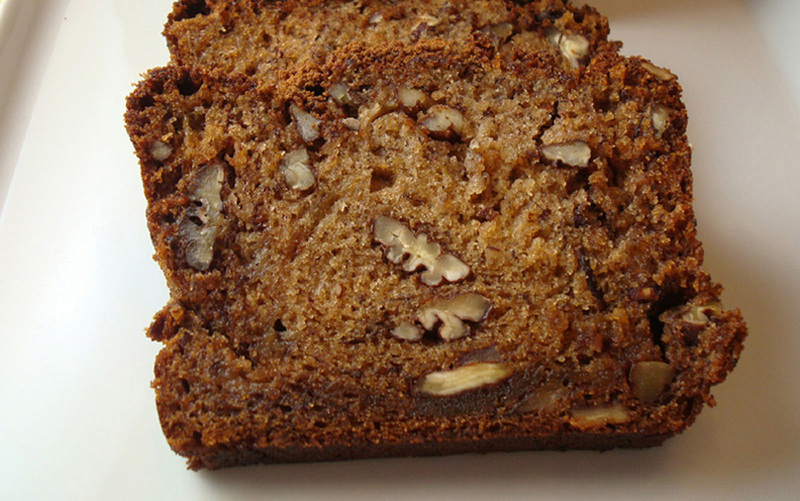 That evening, my hubby eagerly reached for a slice of fresh-baked banana bread. And the next morning, just like always, he grabbed a banana for breakfast. After all, some habits never die. They just become more appreciated for all their quirky charm. Preheat oven to 350 degrees. Butter and flour a 9-by-5-by-3-inch metal baking pan. Whisk 1 ½ cups flour, 1 cup sugar, 1 teaspoon cinnamon, baking soda, and salt in medium bowl. Whisk next 5 ingredients in large bowl until smooth. Add dry ingredients; stir to blend. Transfer batter to pan. Mix 2 tablespoons granulated sugar, 1 teaspoon cinnamon, and brown sugar; sprinkle over batter. Wow, I didn’t realize they had banana breads at Bakesale Betty. I always go for the scones. But now I have to try this, mostly because while I do like a good banana, I can’t stand how they get bad fast! So this sounds great (and looked really good too)! I’ve tried Bakesale Betty’s banana bread & found it too coffeecake like & not enough banana flavors. I’ll try to make it one day though. This recipe is also excellent with the crumb topping left off. If you can’t make it out to try the fried chicken sandwich, the recipe is available on the san francisco chronicle website (in the recipe section). I tried this 1x before it tasted like Bakesale Betty’s banana bread, this bread is addictivee. I cut down on the nuts and only added half of a cup of walnuts. Even though I am not very fond of nuts at all it gives it texure and compliments the bananas very well.